Raise your hand if you’ve ever wanted to write a novel. Don’t be shy, raise your hand. Writing a novel is a lifelong dream for many people, although few ever accomplish the task. They have ideas and some even go as far as to have notebooks full of scribbles and doodles with their bestselling novel ideas… but that’s where they stay, in little notebooks, crammed in drawers or on an office shelf. Someday, we say, someday when we have more time. Well this year, I said my novel idea had sat in my notebooks and locked away waiting for ‘someday’ to come for too long. It’s a few weeks since November, which many aspiring novelists will immediately recognize as National Novel Writing Month, or NaNoWriMo for short. If you’re unfamiliar with NaNoWriMo, check it out here. The goal of NaNoWriMo is to get writers to plant their butts in front of their computer or notebook and hammer out 50,000 words in 30 days. To take their novel from beginning to end in under a month. It was a daunting challenge, but I would not be dissuaded. So, I took the NaNoWrimo Challenge, and spent the next thirty days juggling work, family commitments, and a host of other responsibilities while all the while trying to sneak in 30 or 40 minute writing sessions to work on my novel. 30 days later, although perhaps a bit undernourished and sleep deprived, I emerged, victorious. Now I am an official, NaNoWriMo winner. Was it hard? Yes. Were there bouts of writer’s block? Yes. But I found some useful techniques to break writer’s block and get my 50,000 words out of my head and onto the page. I hope they can help you as well! Whether you’re a seasoned pro, or just trying to hammer out your own novel for National Novel Writing Month, writer’s block can strike anytime, anywhere, indiscriminately. How do you conjure creativity amidst your busy schedule? You’re juggling a host of responsibilities- Work, school, friends, family, pets, all of these can crowd in, tire us out, and make us feel like we’re trudging through a bog rather than swimming in a river of creative energy. Well, there’s good news: With the right tools, you can break writer’s block even during your driest writing spells. Here are 3 ways to wake up your inner creative genius and Beat Writer’s Block! Pinterest can be a powerful resource for aspiring authors. It is a virtual pin board for millions of users who collect their favorite pictures, quotes, how-to articles, styles, architecture, and virtually anything that strikes their fancy. If you’re unfamiliar with Pinterest, check out Mashable’s beginner’s guide. You can make individual pin boards to capture any photos, stories, or articles that fit scenes, setting, or characters for your novel. Here’s how: Say you’re writing the world’s next best selling steam punk adventure novel. 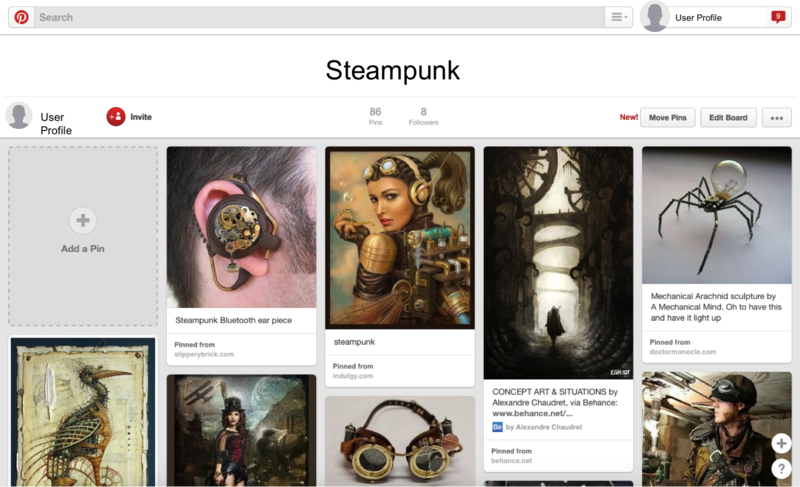 Create a Pinterest board titled “Steampunk” and then search pinterest for this term. You’ll find hundreds of pictures that you can scroll through. When you find one that catches your attention or feels like it could fit in the world of your story, pin it to your board. Create Pinterest boards for different aspects of your novel: Characters, Clothing, Important Objects, Buildings… anything and everything. Spend a few minutes every day searching Pinterest for inspiring images that capture the essence of your novel. You may find a new character, setting, or plot point buried among the thousands of pins. Browse them anytime you feel a spout of writer’s block starting to build up. Pick an image from your boards and write a scene describing what is happening in that picture. Incorporate that scene into your story. You can make a character wear a specific article of clothing from your pin board or have your protagonist live in that tree house you pinned to your board the last time you were browsing. Maybe you’ve pinned a picture of an adventurous space pirate you found on Pinterest. Make him/her the next character your protagonist meets! This is the power of Pinterest. It is a bottomless well of inspirational images that can be fodder for your next scene or novel. Make a Pinterest board for characters, settings, special objects, clothing, worlds, countries, animals… anything and everything! When writer’s block begins to creep up on you, you’ll discover treasures you pinned to your boards months ago and had completely forgotten about. What are you waiting for? Get pinning! What character would use this word? When would the protagonist come in contact with “moosemilk”? Your daily challenge will be to incorporate this word into your daily word count goal. Each day brings a new word, and each word brings a new challenge to fit your word of the day into your current scene or project! 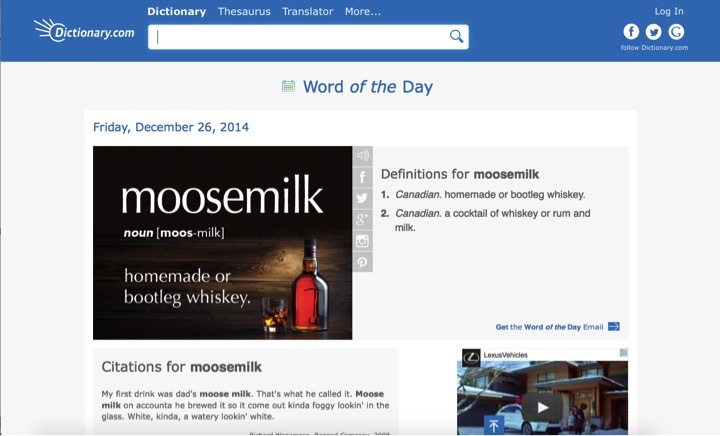 Take “moosemilk”, above. What character would use this word? When would the protagonist come in contact with “moose milk”? Does she brew her own? Does she frequent a local pub or hole in the wall where she can sit, drink, and brood? Perhaps she needs help from an eccentric character who is full to the brim with moosemilk and…wisdom. Don’t underestimate the power of this one word challenge. I have created brand new characters, some of which have become personal favorites, entirely based on the word of the day. You may find a plot twist lurking in your word of the day, or perhaps your perfect ending. Don’t worry about writing a scene out of order! If you word of the day triggers a flash of genius, write it. You can always find a place for it in your novel later. If you’re feeling an extra bout of daring coming on, you can browse back through past words of the day, pick three, and write one scene around each. You’ll soon find that it may only take one little word to unleash the torrent of creative energies that had previously been stopped up by that dreaded curse, writer’s block. Sometimes it helps to ditch the word processor for a bit, and use old-fashoned longhand. Today we’re all used to working on laptop computers, tablets, or even our smart phones. 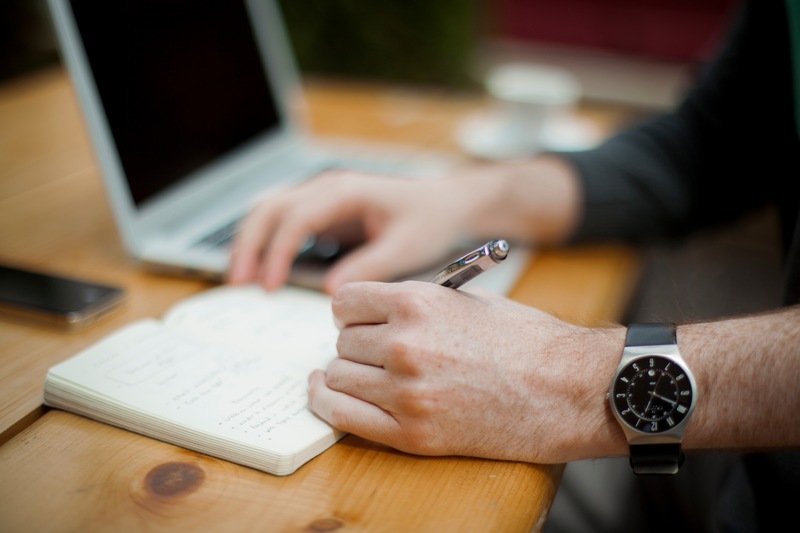 While using a word processor has obvious advantages and is practically a necessity today, it’s easy to fall into the same habits and routines when we write. Sometimes these routines can turn into ruts where you find yourself a little starved for inspiration. Switch it up. Grab a moleskine notebook and a quality pen and use the tips above to write a scene or two in good old-fashioned longhand. There are many advantages to writing longhand. It gives your brain time to think about what you’re writing and there’s something wonderfully nostalgic and fulfilling about seeing your novel unfold before you in your own hand. Additionally, I have found that scenes that I write in longhand first often turn out to be my most creative and detailed scenes by the time they make it into my story. Writing longhand forces me to type what I wrote into my word processor at a later date. I have found that as I type out what I wrote in longhand, I always add more details and plot elements then I originally wrote out. My internal editor won’t let me get away without a little rewrite as I go. The typed version of the scene ends up being much better than the first, all because I took the time to write it out in longhand! So slow down every once in a while, grab an old-fashioned pen and paper, and don’t worry about that little flashing cursor on the screen for a day or two! There you have it! 3 surefire ways to break writer’s block! Remember, make sure that you keep all your notes, pictures, inspiring words or phrases, and character notes all in one notebook or application so that you can easily browse back and keep the creative flame alive! Now you’re ready to write that key moment, that scene that defines the whole novel! Hero’s will rise, evil will be vanquished, long lost lover’s will find each other, and destinies will be changed forever! Do you have your own surefire way of breaking writer’s block? Let me know in the comments below and help your fellow writers get their novel out of their heads and onto the page! Found these tips helpful? Help share them using the share buttons below!